To answer this question, two main things need to be considered: housing and commute. Everybody will tell you, living in the Silicon Valley is very expensive. And they are right. It is probably one of the most expensive areas in US. On top of that, the commute can also be difficult, because there is a lot of traffic and a lack of public transportation. To help you consider both those things, some useful information regarding housing and transportation are provided bellow. - From Stanford to SJ, including cities like Mountain View, Sunnyvale, Cupertino, Santa Clara. On the first map below, information are provided about the repartition of postdocs in these areas, the average rent per person, the average commuting time and what commuting types are used by postdocs living in this area. The second map aims at displaying information more specific to different categories of postdocs. All the information presented above is based on postdoc information from a survey made in 2017 by SURPAS. 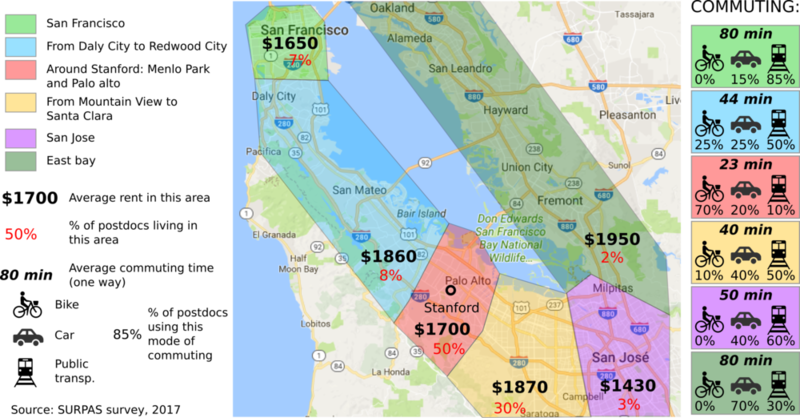 We hope that it would help you choose where to live around Stanford. Two good places to find housing are craigslist and the website for the Stanford community, SUpost. Be wary of scams and don’t provide money until you have met your fellow housemates and feel comfortable. Postdocs can receive a free pass to travel on the Caltrain which opens up a much wider area, and Stanford offers free Marguerite shuttles servicing the Stanford community. Two shuttles go further afield - the Marguerite AE-F line to Fremont and the Marguerite SE line to Mountain View. Keep in mind however that some lines have sporadic or seasonal schedules. The campus is big, and traversing campus itself is often done by bike or Marguerite shuttle. Bicycle commuting is very common within a ~6 mile radius of campus as the terrain is generally flat and many roads have dedicated bicycle lanes, and the Caltrain and most Marguerite shuttles also carry bicycles. If you are not driving to the campus, the Commute Club will pay you money (monthly parking passes are available but are expensive). If you choose to operate a car or motorcycle you will need a Driver’s licence which you can obtain from the California Department of Motor Vehicles (DMV) by taking the required tests. You would be considered a resident by the DMV, regardless of your visa status and should apply for a Californian licence. You may not drive with your international driving permit, as long as are residing in California. Applying for driver’s licence also doubles as a handy form of ID and is relatively cheap. Google maps is a great tool for planning your journeys in the bay area, as it integrates information from all the services listed above.